Books: April 2010 [Recap] – my books. my life. I’m a little in denial that it is already May, but I guess I can’t do anything about the passing of time. April was a pretty decent reading month for me. I got a little behind on reviews though, so expect to hear about some of these books this month. Did everyone else have a good April? ooh, you read a few books that i have on my wishlist… i keep hearing good things about The Lost Summer and A Reliable Wife. I loved The Lost Summer of LMA. I was not a huge fan of A Reliable Wife, but I know a bunch of other people that loved it. Thanks for your suggestions! I didn’t have a good reading April, unfortunately. I had a lot of work and little time for reading. But I finished The Girl Who Kicked the Hornet’s Nest and that was 750 pages! Ciao. A. You seem to have had a wonderful reading month in April! 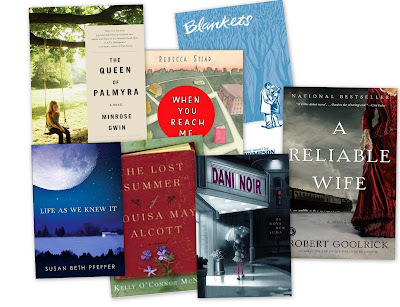 I loved most of the covers of the books you read in April. In addition to having a wonderful reading month, you seem to have had a wonderful ‘cover’ month 🙂 Did you choose the books with the beautiful covers consciously?